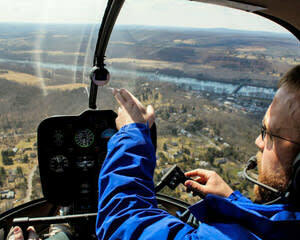 Take the controls of a helicopter as you pilot the Robinson for a 30 minute flight near Philadelphia. Your dream of flight is made possible after beginning with a ground school that features a safety briefing and an overview of piloting the aircraft. Under the watchful guidance of your professional flight instructor, you’ll be flying the 2-seater, dual control Robinson R22 out of northeast Philadelphia for a full 30 minutes of flight time. For any fledgling pilot, a helicopter flight lesson is the perfect hands-on experience where you get to control the aircraft. Book now!